showing the fertility of the soil. The people rejoiced that they were to come into possession of so goodly a land, and they listened intently as the report was brought to Moses, that not a word should escape them. "We came unto the land whither thou sentest us," the spies began, "and surely it floweth with milk and honey; and this is the fruit of it." The people were enthusiastic; they would eagerly obey the voice of the Lord, and go up at once to possess the land. But [p. 388] after describing the beauty and fertility of the land, all but two of the spies enlarged upon the difficulties and dangers that lay before the Israelites should they undertake the conquest of Canaan. They enumerated the powerful nations located in various parts of the country, and said that the cities were walled and very great, and the people who dwelt therein were strong, and it would be impossible to conquer them. They also stated that they had seen giants, the sons of Anak, there, and it was useless to think of possessing the land. But the ten, interrupting him, pictured the obstacles in darker colors than at first. "We be not able to go up against the people," [p. 389] they declared; "for they are stronger than we. . . . All the people that we saw in it are men of a great stature. And there we saw the giants, the sons of Anak, which come of the giants: and we were in our own sight as grasshoppers, and so we were in their sight." In humiliation and distress "Moses and Aaron fell on their faces before all the assembly of the congregation of the children of Israel," not knowing what to do to turn them from their rash and passionate purpose. Caleb and Joshua attempted to quiet the [p. 390] tumult. With their garments rent in token of grief and indignation, they rushed in among the people, and their ringing voices were heard above the tempest of lamentation and rebellious grief: "The land, which we passed through to search it, is an exceeding good land. If the Lord delight in us, then He will bring us into this land, and give it us; a land which floweth with milk and honey. Only rebel not ye against the Lord, neither fear ye the people of the land; for they are bread for us: their defense is departed from them, and the Lord is with us: fear them not." Moses now arose and entered the tabernacle. The Lord declared to him, "I will smite them with the pestilence, and disinherit them, and will make of thee a greater nation." But again Moses pleaded for his people. He could not consent to have them destroyed, and he himself made a mightier nation. Appealing to the mercy of God, he said: "I beseech Thee, let the power of my Lord be great according as Thou hast spoken, saying, The Lord is long-suffering, and of great mercy. . . . Pardon, I beseech Thee, the iniquity of this people according to the greatness of Thy [p. 391] mercy, and as Thou hast forgiven this people, from Egypt even until now." Though their hearts were unchanged, the people had been brought to confess the sinfulness and folly of their rebellion at the report of the spies. They now saw the value of the blessing which they had so rashly cast away. 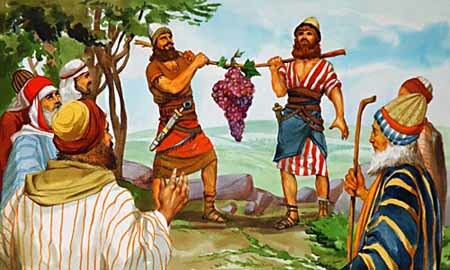 They confessed that it was their own unbelief which had shut them out from Canaan. "We [p. 393] have sinned," they said, acknowledging that the fault was in themselves, and not in God, whom they had so wickedly charged with failing to fulfill His promises to them. Though their confession did not spring from true repentance, it served to vindicate the justice of God in His dealings with them. The trumpet sounded an alarm, and Moses hastened after them with the warning, "Wherefore now do ye transgress the commandment of the Lord? but it shall not prosper. Go not up, [p. 394] for the Lord is not among you; that ye be not smitten before your enemies. For the Amalekites and the Canaanites are there before you, and ye shall fall by the sword." Click here to read the next chapter: "The Rebellion of Korah"